It was announced yesterday that director Zack Snyder will be stepping down from DC’s forthcoming Justice League movie. Marvel’s Avengers director Joss Whedon will step in to guide the film through the post-production phase, as well as to shoot a few additional scenes that have yet to be filmed. As of now, the film is still on track to hit its Nov. 17 release date. Zack Snyder—who has also directed such massive films as Batman v. Superman and 300—recently revealed that his daughter had committed suicide in March. She was only 20 years old. At that time, the film was put on a two-week hold, and only a small circle of family and friends knew what had happened. In my mind, I thought it was a cathartic thing to go back to work, to just bury myself and see if that was the way through it. The demands of this job are pretty intense. It is all-consuming. And in the last two months, I’ve come to the realization … I’ve decided to take a step back from the movie to be with my family, be with my kids, who really need me. They are all having a hard time. I’m having a hard time. 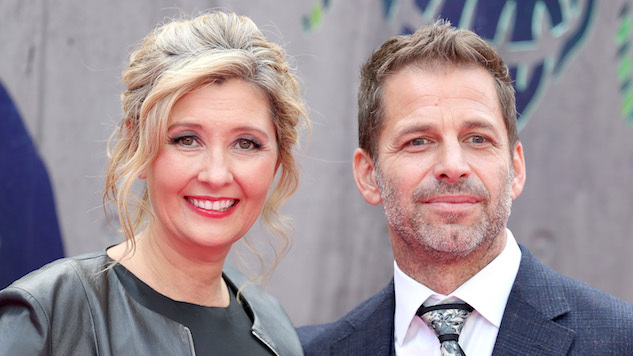 Warner Bros. Pictures has been exceptionally generous to the Zack and his wife, Deborah Snyder, throughout this trying time. In a business that can at times seem impersonal and cutthroat, it’s encouraging to hear that not only was the studio willing to push back the film’s release—no small decision as DC attempts to build a competitor to Marvel’s Cinematic Universe—but they also extended the length of Snyder’s deal with the studio, allowing him the possibility of getting a first-look at any forthcoming films with a first-dibs chance to direct anything he finds intriguing. The impetus for Snyder’s handing the reigns over to Joss Whedon was the film’s expected filming excursion to England. After screening a rough cut of Justice League for a few fellow filmmakers and friends, Snyder realized he wanted to film a few additional scenes. To that end, Snyder hired the exceptional Whedon to write them. The scenes in question were to be shot in England, and that’s when Snyder realized it was the wrong time to leave his family. It made sense for Whedon to take over at this point since the film was mostly finished, and the additional scenes had been written by Whedon in the first place. The directing is minimal and it has to adhere to the style and tone and the template that Zack set. We’re not introducing any new characters. It’s the same characters in some new scenes. He’s handing the baton to Joss, but the course has really been set by Zack. I still believe that despite this tragedy, we’ll still end up with a great movie. Here’s the thing, I never planned to make this public. I thought it would just be in the family, a private matter, our private sorrow that we would deal with. When it became obvious that I need to take a break, I knew there would be narratives created on the internet. They’ll do what they do. The truth is … I’m past caring about that kind of thing now. I want the movie to be amazing, and I’m a fan, but that all pales pretty quickly in comparison,” he says. “I know the fans are going to be worried about the movie, but there are seven other kids that need me. In the end, it’s just a movie. It’s a great movie. But it’s just a movie. Yes, Zack Snyder and his wife have seven children and step-children between the two of them. It is beyond impressive that Snyder can balance such a prolific film slate along with managing such a substantial family. It also shows why he felt the need to take a step back. His family needs to come first right now. Be sure to check out the most recent, high-octane Justice League trailer here.